My eldest niece - lovely, brilliant, open and compassionate - is graduating from high school this weekend. (And she is the first of many – soon to be followed by her sister and other family members in the US and Australia). I’m stumped on a proper gift. I have a few ideas, but I’d like to think further about a more significant way to help her start the next phase of her life. Of course, because I am me, I’m wondering about her living situation next year when she moves away from home for college. The times I moved away from home for school – well before working in the world of interiors - my interior design goals always followed a few basic themes. My space needed to be functional, temporary, personal, and extremely frugal. At different times and in different settings these themes would vary in importance, but I always put some effort into thinking about the space, even if it was to wonder – is there a way I can live with furniture found by the curbside, since I’m only here for a few months? I suspect these thoughts are shared by many young adults creating a temporary “home away from home”, so I’ve taken some time to look at dorms and shared rooms – bare-bones and extravagant – and consider design tips and advice for my niece in her future space. These spaces can be tiny, cramped, and architecturally challenged, so I’ve put together a Pinterest board on a few dorm rooms done well (considering…) but first here are a few tips, both emotional and practical. The best advice I can offer are some of the same tips I would give to clients for their spaces. Also, many of the tips from my 'Tween Rooms post also apply, just with added maturity. Edit your belongings. Start with less; you can always add more. You want your room to show personality without your personality becoming lost in the mess (and there will be mess). Be extremely selective about what you present to others. Take some time to really think about what is most important and what makes you happy, and your true self will shine through. Layer your lighting. String lights are a dorm room classic. While they might be unoriginal, they are one valid way to add variety alongside the standard (somewhat lacking in ambiance) single overhead light, plus the inexpensive swing arm desk or clip-on lamps. I encourage all new dorm residents to look for at least one way to add a lighting accent that moves beyond the typical. Find a uniform base color scheme. Unless you are completely in sync with your new roommate – whom you’ve never met – start with an agreement to keep the base similar and neutral. Black and white is easy. Earthy neutrals are another option. From there you can each add your own accents with colored pillows or artwork, but the underlying connection will keep the room feeling more cohesive and calm. From HGTV.com a simple brown and tan palette brings together a full and busy room. Add a few circles or other shapes. The vast majority of dorm rooms are box-like, right down to the box-like furniture. Add a couple of other shapes with a circular rug, a chair, or a hanging light to relieve the boredom. Edit how you present your belongings. Use your recently honed geometry skills to arrange your photos, posters, postcards or other collections. Place items in similar or coordinated frames (if you are using frames). Balance your shelves and organize them in a way that is functional as well as visual. Use interesting canisters and boxes in coordinating colors or textures to collect and display your stuff. 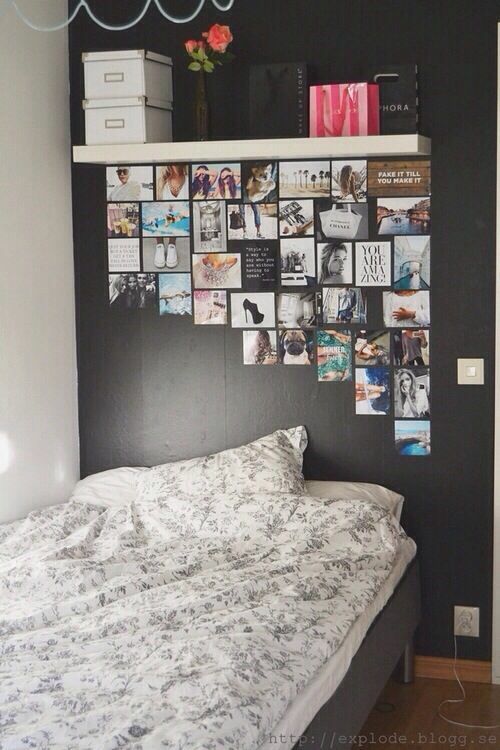 Found on Prettydesigns.com a careful placement of snapshots — clean and creative. Accent your walls and your floors. A single painted wall is a great way to anchor a room (or your particular part of the room), but this is not likely an option in most dormitories. Temporary wallpaper, vinyl wall decals, paint chips, and washi tape can all be used to decorate a door, a room divider, or a single wall. A large abstract art poster, nature image or a bright or textural rug make fantastic “headboards”. Area rugs will set the tone for the room, and make it so much more comfy.